• It is found that in the floating-point representation we can cover a much larger range of numbers than that is possible in the fixed-point representation. • In the floating-point representation the resolution decreases with an increase in the size of the range; this means that the distance between two successive floating-point numbers increases. • In the floating-point scheme, resolution is variable within the range. However, for the fixed-point format, resolution is fixed and uniform. • This variability in resolution provides a large dynamic range of the numbers. To the ideas given above can be illustrated, by considering case of a 16-bit computer. Example 35: Consider a 16-bit computer. Obtain the dynamic range and resolution when the computer is operated (a) fixed-point format and (b) in the floating-point format. In this scheme, we also find that we can represent only whole numbers; we can not represent fractions. We find that in this case, the range (sometimes called the dynamic range) has been considerably decreased, but resolution has been greatly increased. In the floating-point format, we reserve 5 bits to represent the exponent, 1 bit to represent its sign, 9 bits to represent the mantissa part, and 1 bit to represent its sign. Table 1.38 shows the floating-point representation of the given number. We find that this is achieved by sacrificing uniformity in resolution. Notice that in the floating-point format, compared to larger numbers, whose resolution is coarse, small numbers have finer resolution. IEEE 754 standard for floating-point arithmetic in 32-bit computers is shown in Table 1.39. 1. First, divide the given number by an appropriate power of 10 (radix of the decimal-number system) so that it is converted into a fraction. 2. Multiply the resulting fraction with the same power of 10 (103, here) so that division is cancelled by multiplication; this brings the number back to its original value (468, here). The steps given above may be extended to the binary-number system also to represent a given number in the floating-point format. Example 33: Express decimal number 7 in the binary floating-point format. In the example using decimal number 468, we had X = 468, R = 10, E = 3, and therefore M = 0.468. This restriction imposes the condition that the first bit after the binary point must be a 1. 1. Find the 1’s complement of subtrahend. For this, in the decimal system, subtract the subtrahend from 9 if it is a single-digit number, 99 if it is a double-digit number, and so on. In binary system, complementary number can be obtained by changing 0s to 1s and 1s to 0s. 2. Next, add minuend and complement of subtrahend. This is called as 9’s complement addition in decimal system and 1’s complement in binary system. 3. Finally, add the most significant digit (or, bit) in the sum to the least significant digit (or, bit) in the remaining portion of the number from which the MSD is removed to obtain the resulting subtracted number. Example 30: Subtract decimal number 4 from decimal number 7. Solution: Following step 1, we find the 9’s complement of 4, which is 9 ‒ 4 = 5. Next, add 7 and 5 to yield 12. Finally, add MSD 1 to LSD 2 to get 3. We find that this is the desired result. Example 31: Subtract binary number 100 from binary number 111. Solution: To solve this problem, we use the steps given in Section 1.17.2. We find that 011 is the desired result. Step 3 of Section (Subtraction using 1's Complement) requires that for binary subtraction using 1’s complement, shifting and addition of MSB with LSB has to be performed. Binary subtraction can also be performed using 2’s complement. 1. Find the 1’s complement of subtrahend. 2. Add 1 to the 1’s complement to get the 2’s complement of subtrahend. 3. Add minuend and 2’s complement of subtrahend. 4. Discard the MSB to get the desired difference. Example 32: Subtract (100)2 from (111)2 using 2’s complement. Solution: To solve this problem, we use the steps given in Section 'Subtraction using 2's Complement'. 1. 1’s complement of 100 = 011. 2. 1 + 011 = 100. Binary subtraction is performed in the same way we perform decimal subtraction. 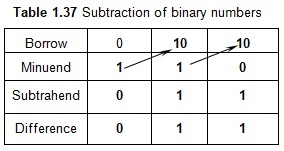 There are two methods for decimal and binary subtraction. In the first method, we use direct subtraction. In the second method, we use an indirect subtraction method called complement’s method. We first discuss the direct subtraction. In this scheme, we subtract a smaller number from a larger number. This is illustrated using an example of decimal subtraction. Example 28: Subtract decimal number 657 from decimal number 725. Solution: To subtract, we write the numbers one below the other as shown in Table 1.33. Then we first subtract the least-significant digit (LSD) 7 from LSD 5. This subtraction is not possible. Therefore, we borrow a 1 from digit 3 in the second bit position and transfer it to LSD position. When this reaches LSD, it gains a weight of 10 and we add this to LSD 5 to make it 10+5 = 15. We can now subtract 7 from 15 to yield the difference 8 in the LSD position. We then move to the second digit position of 3. Since a 1 was borrowed from this place to LSD, we have only a 2 remaining in this position. We now try to subtract 5 from 2 and this is not possible. Therefore, as in the previous case, we borrow a 1 from the most significant digit (MSD) position and add the new weight of 10 to 2 to make it 12. We can subtract 5 from 12 to yield the difference of 7 in the second digit position, as shown in Table 1.34. Finally, we notice that when a 1 is borrowed from the MSD, the digit remaining there would be 6 and 6 ‒ 6 = 0 as the difference in MSD. The steps described above can be used for direct subtraction of smaller numbers from larger numbers. Hence, we will adopt the same procedure to perform binary subtraction. As in the case of binary addition, for subtraction also we prepare subtraction tables. 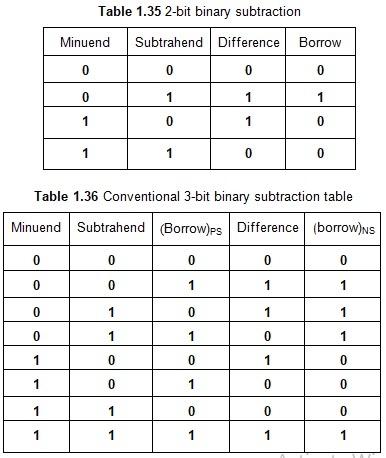 Table 1.35 shows the 2-bit subtraction, and Table 1.36 shows the 3-bit subtraction. Example 29: Subtract binary number 110 from binary number 1110. Solution: To subtract, we write the numbers one below the other as shown in Table 1.37.